Passed High School/10th/SSC exam with Science & Maths Subject with minimum 35% marks. Fashion Technology Diploma- Passed High School/10th/SSC Exam with minimum 35% marks. 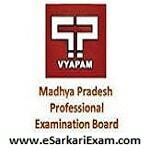 Eligible Candidates can Submit MP Pre Polytechnic Test 2019 Online Application at the Official Website of MPPEB Vyapam Latest by 16th March 2019. Applicants First Open MPPEB Official Website. Click on PDF Link and Open Advertisement.